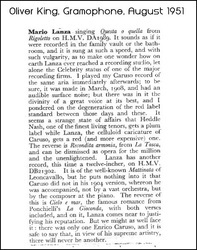 Armando Cesari, Vince di Placido, LeeAnn Cafferata, Derek McGovern and Stefanie Walzinger contributed articles to the press section. 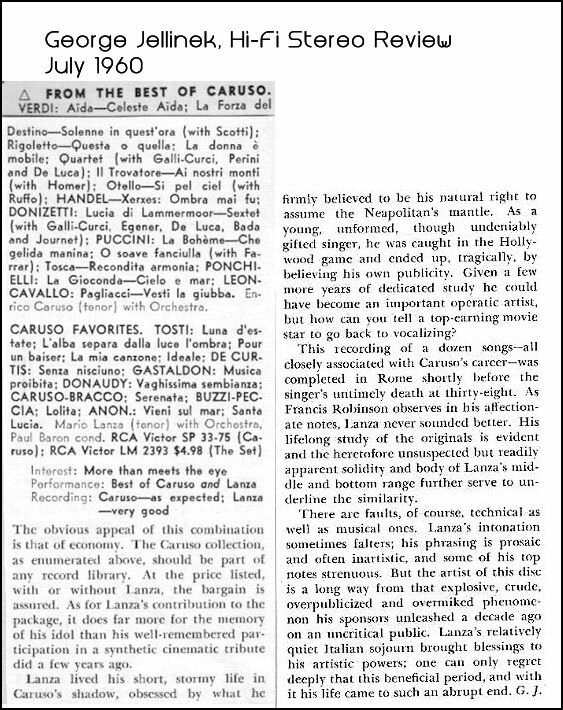 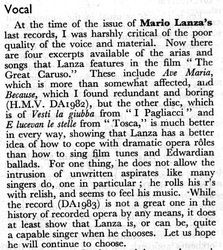 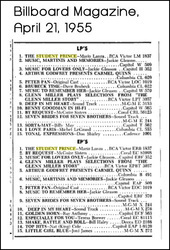 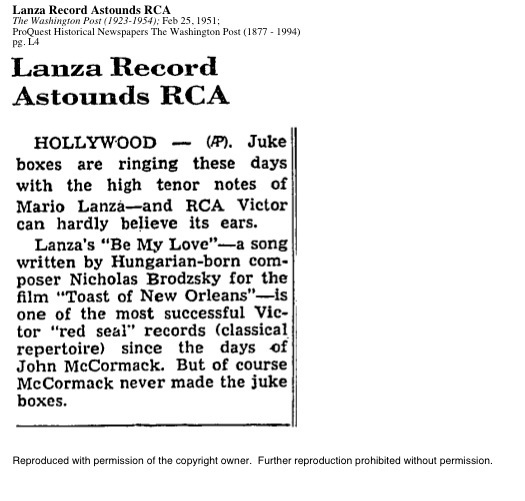 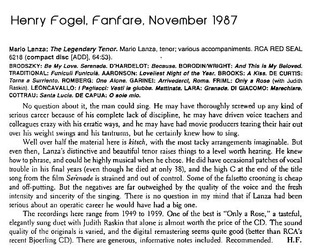 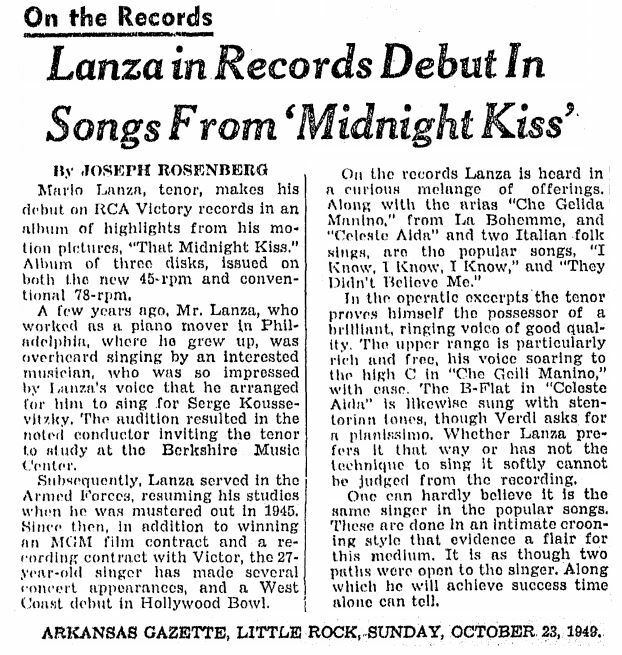 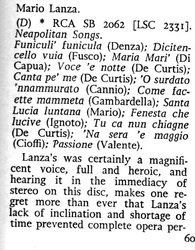 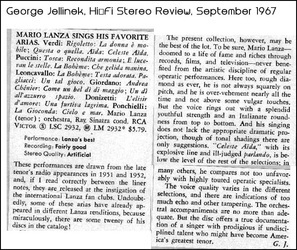 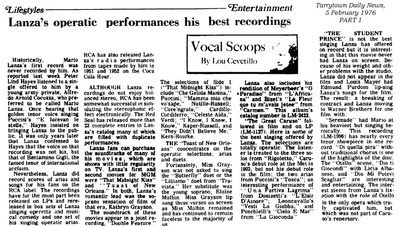 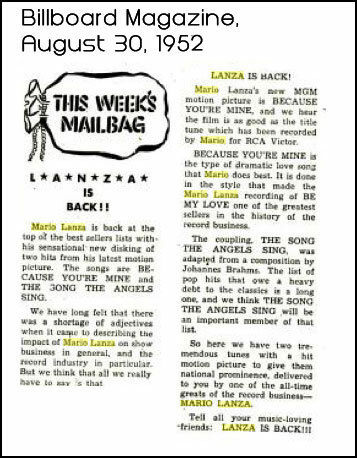 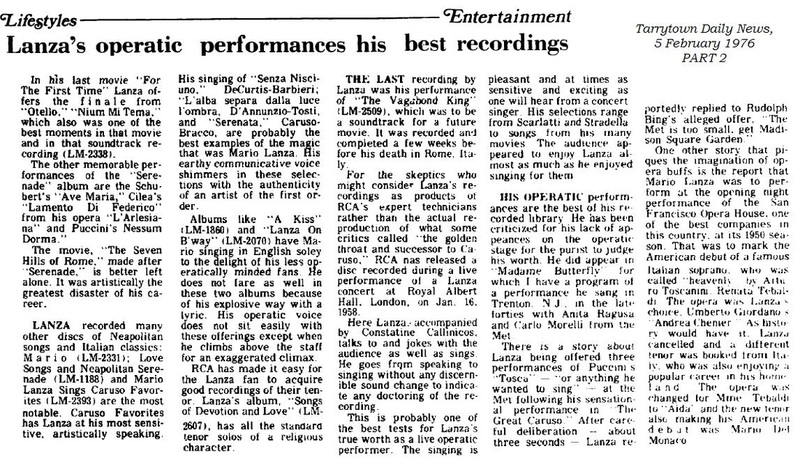 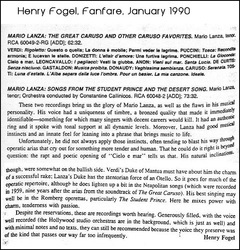 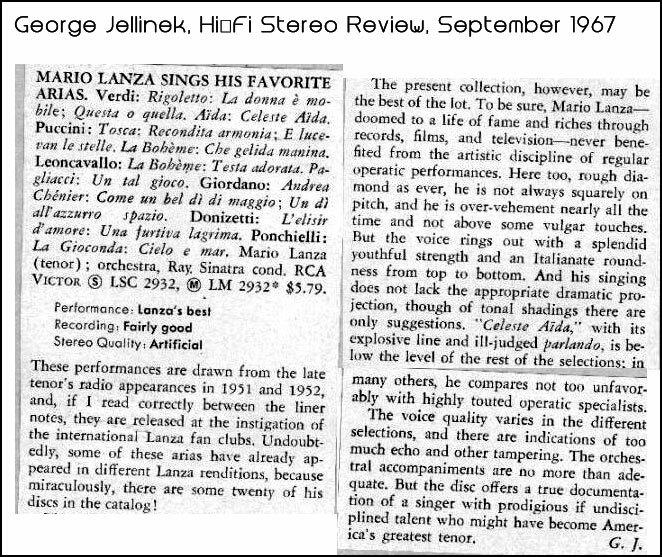 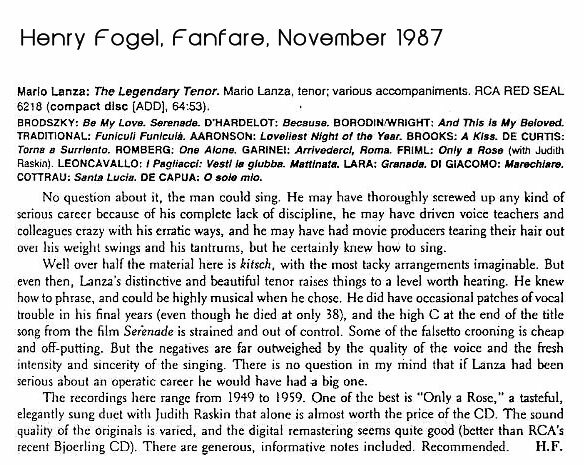 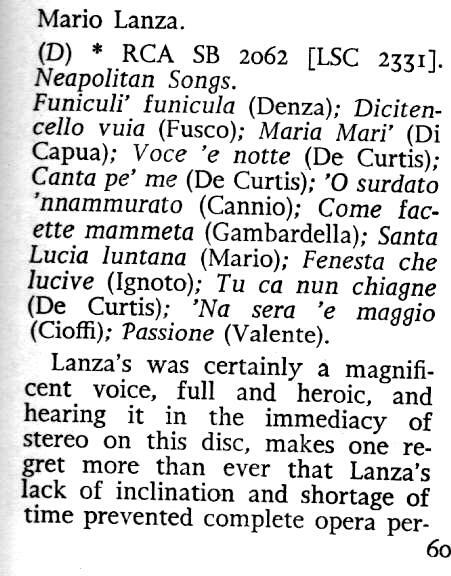 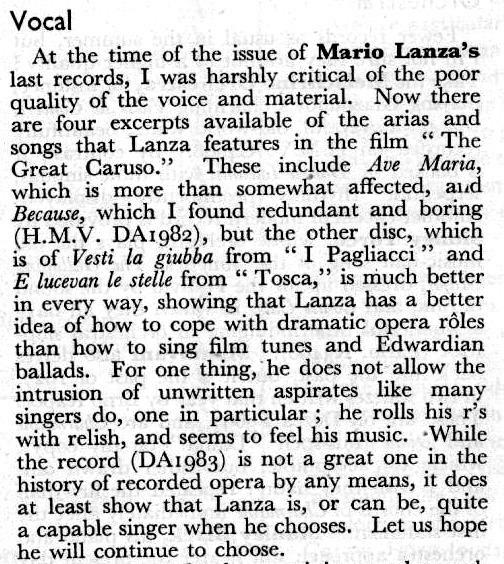 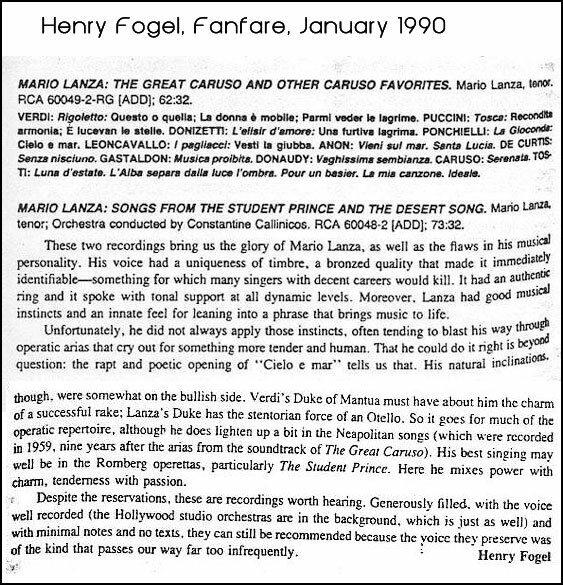 Here is a sampling of the diversity of critical opinion on Lanza over more than forty years, from the release of his first commercial recordings in 1949 to some of the early CDs from the late 1980s. 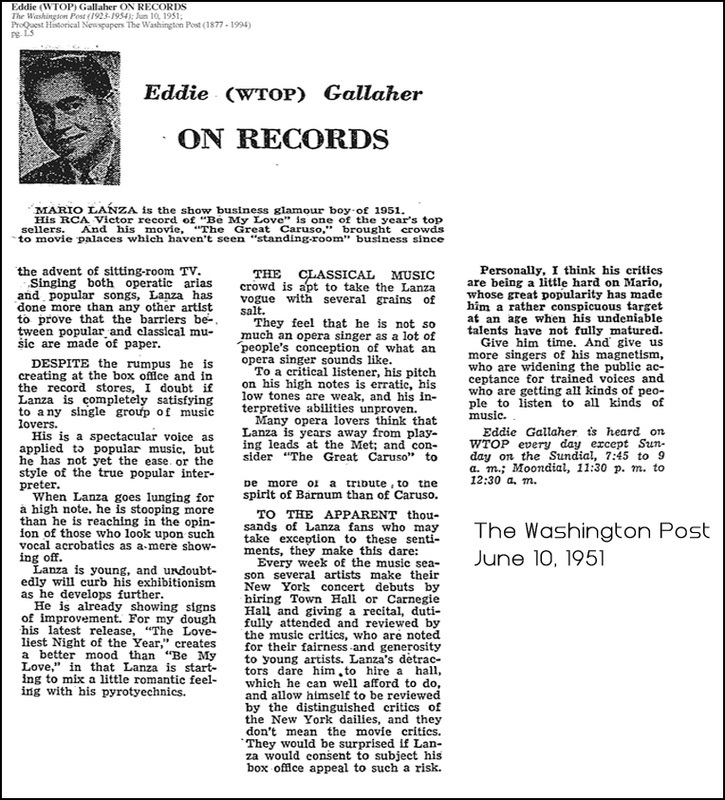 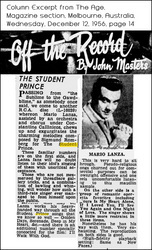 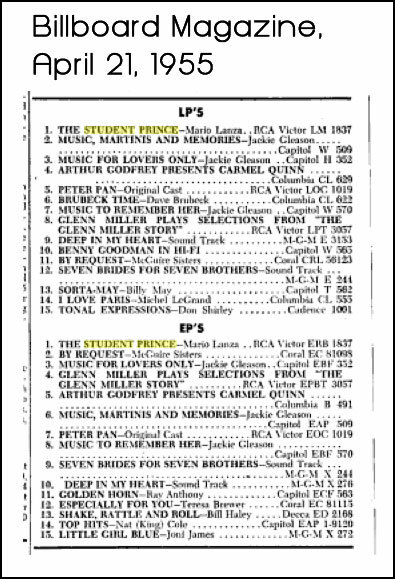 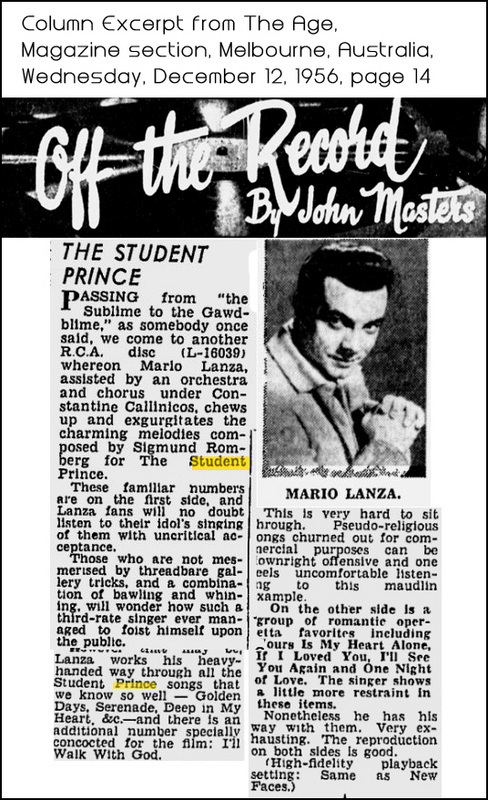 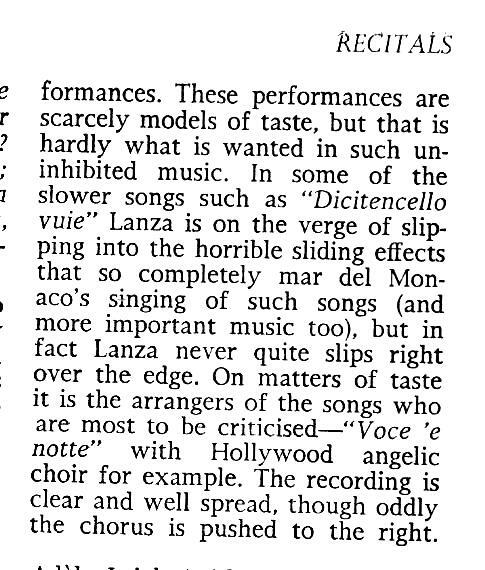 These range from John Masters's astonishingly vitriolic 1956 review of the tenor's MGM recording of The Student Prince to Prof. Henry Fogel's laudatory remarks about the same album 34 years later. 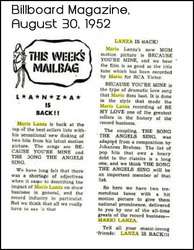 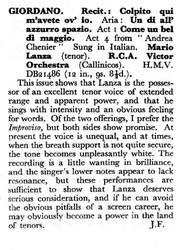 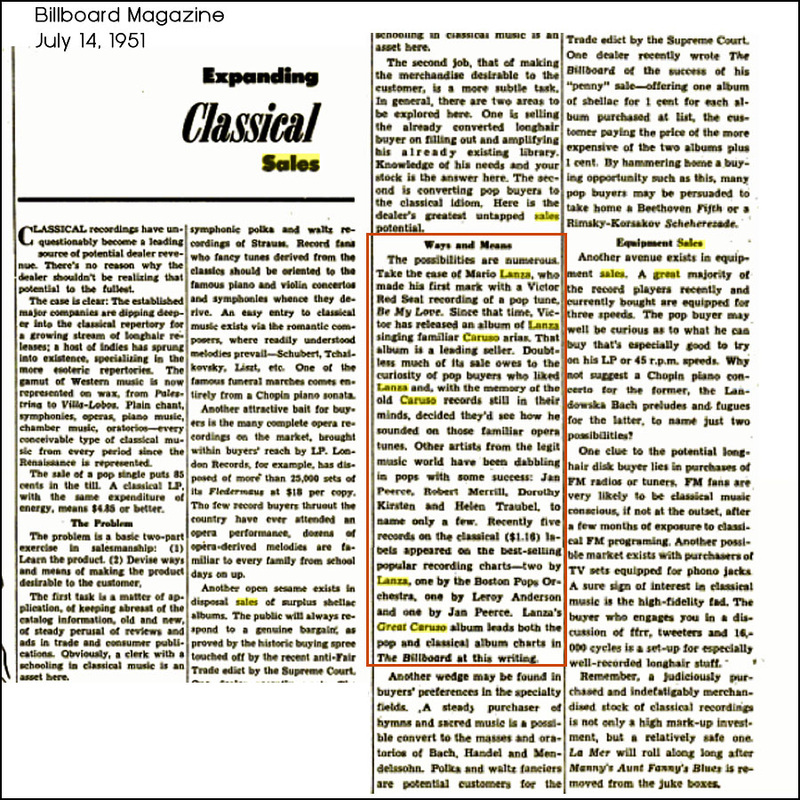 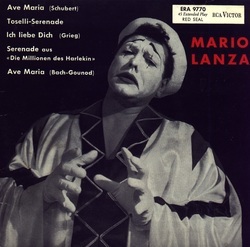 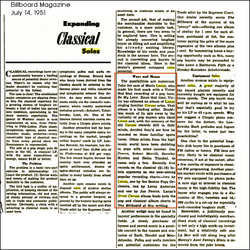 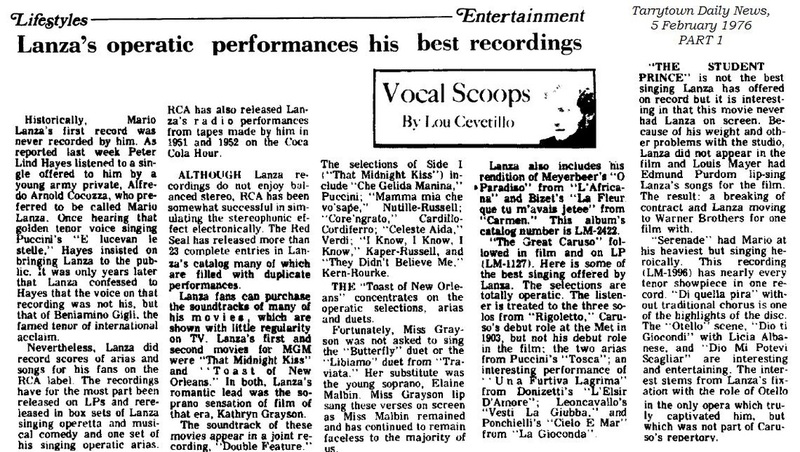 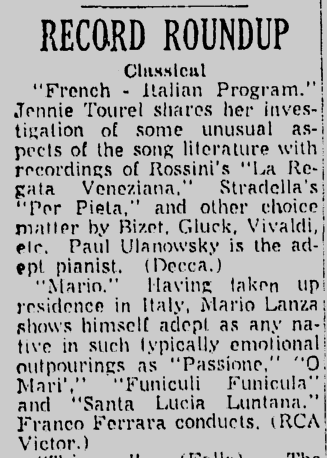 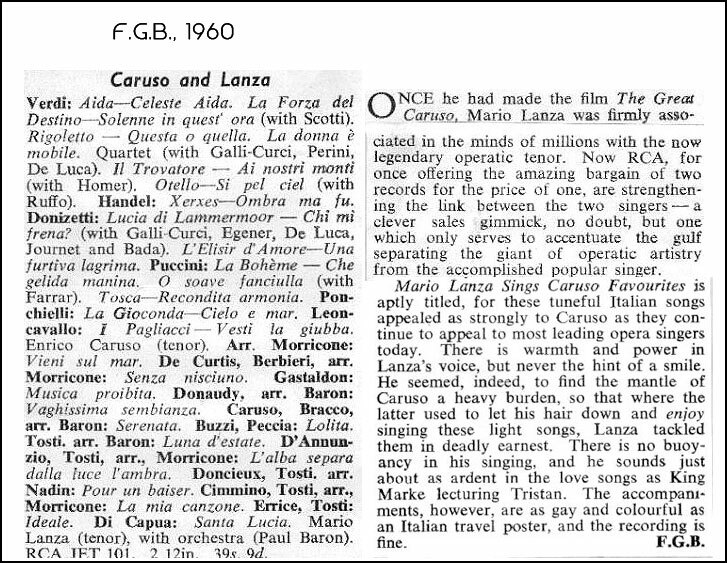 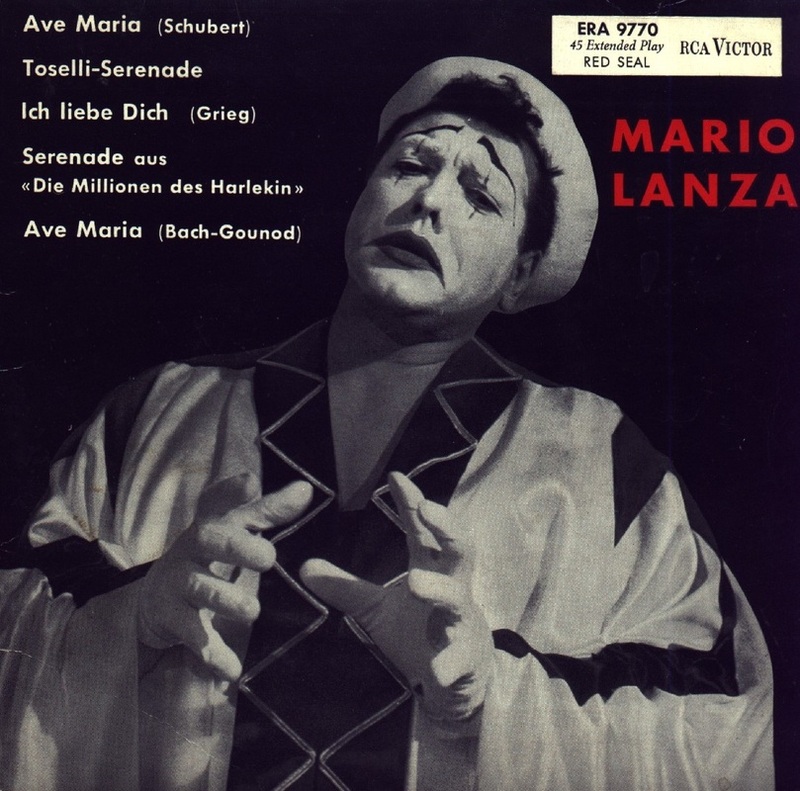 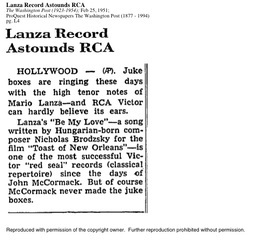 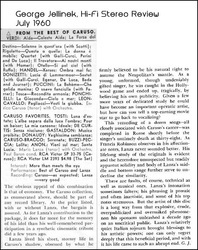 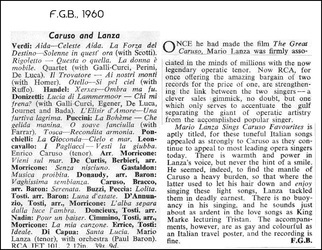 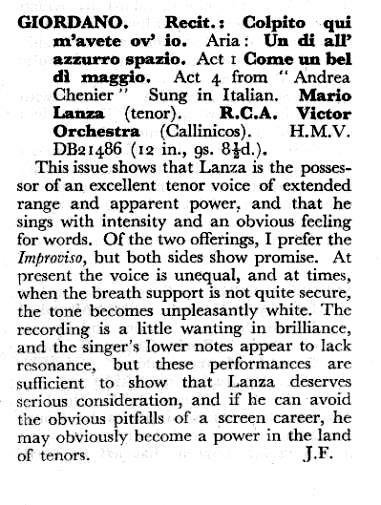 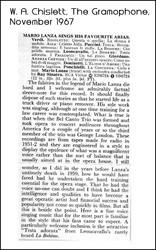 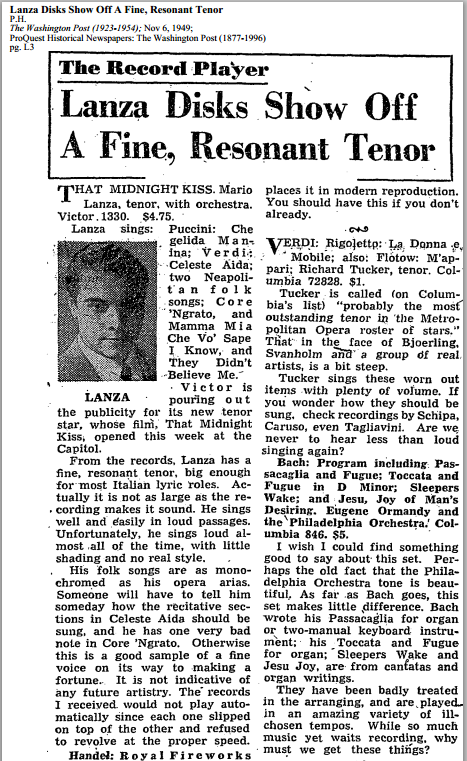 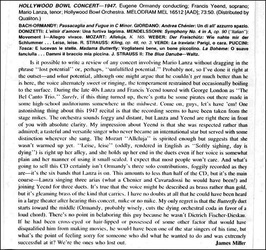 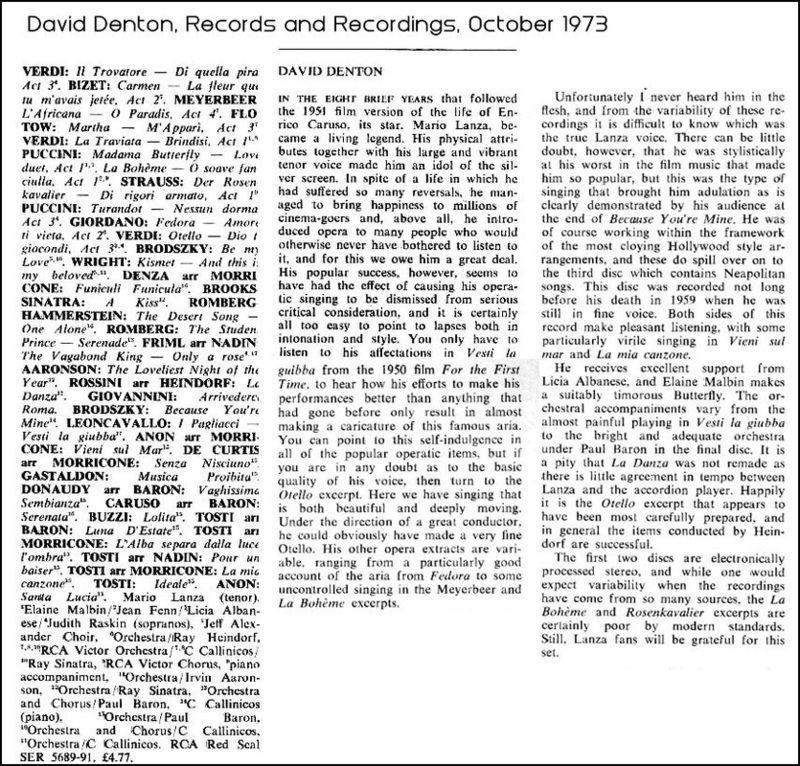 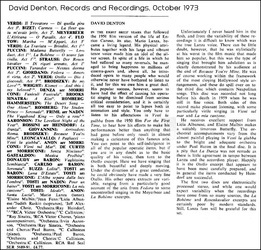 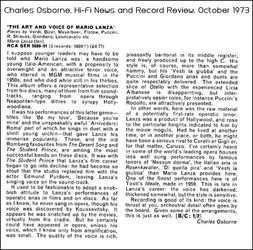 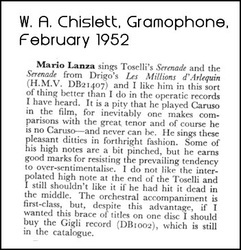 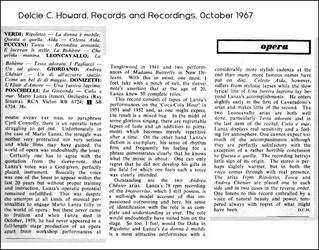 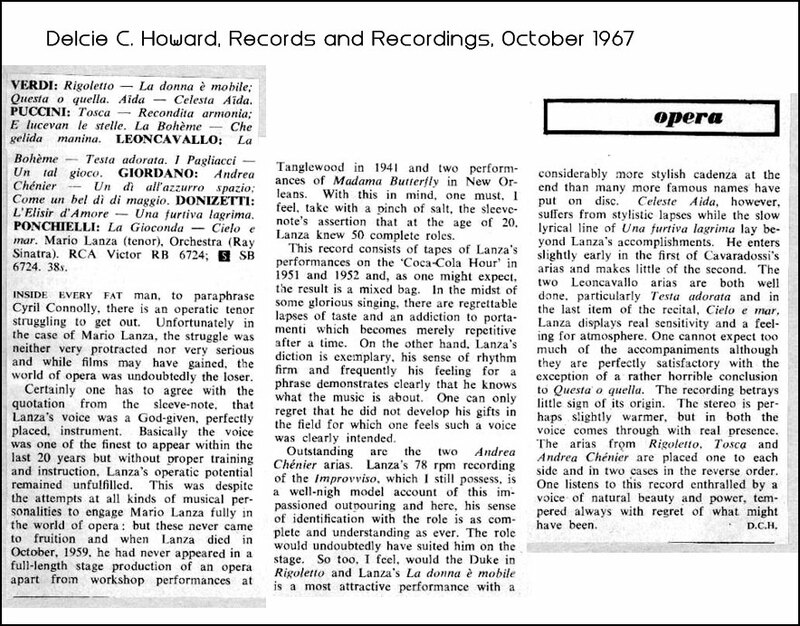 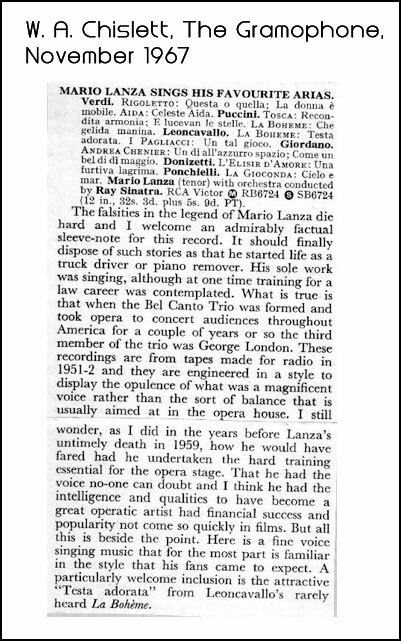 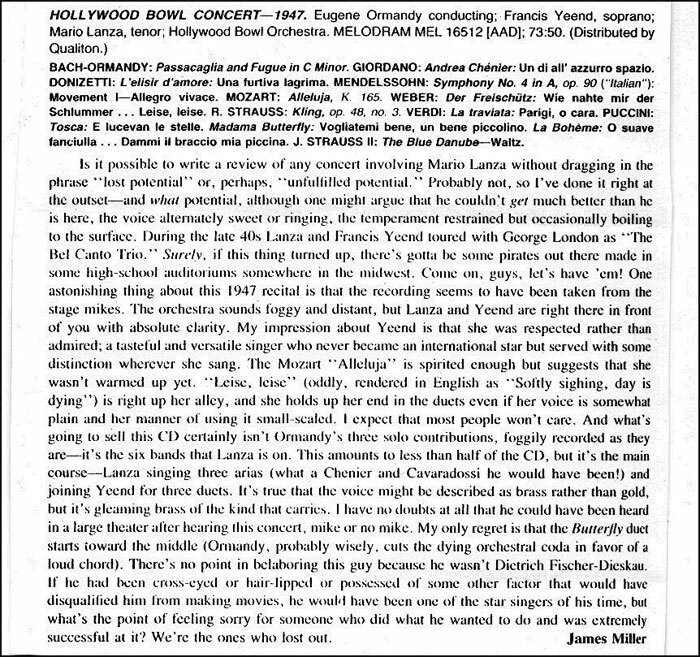 Similarly, Lanza's 1950 recording of the Improvviso from Andrea Chénier (Un Dì All'Azzurro Spazio) is praised here by two critics (one of whom describes it as "a well-nigh model account" of the aria), while a third dismisses the entire album on which it was featured (Opera Recital) as containing "nothing that could be seriously recommended to the musical public." 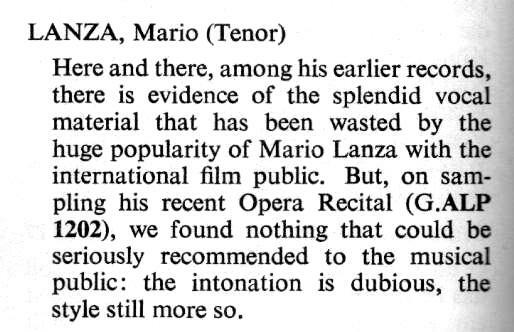 Lanza's admirers are not immune from attack either, with Gramophone's Oliver King apparently irritated by their proliferation (and supposed lack of erudition) when he dismisses the tenor's 1950 recording of "Recondita Armonia" as "opera for the million and the unenlightened." 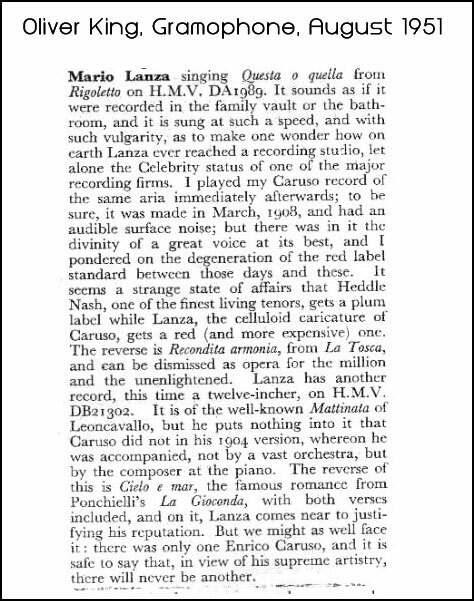 (Time Magazine would make similarly dismissive comments about Lanza's public eight years later.) 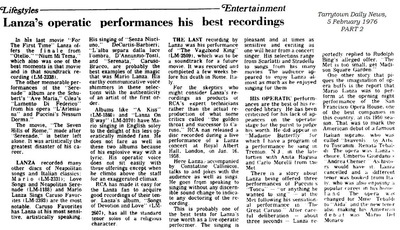 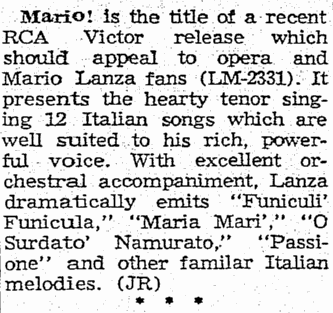 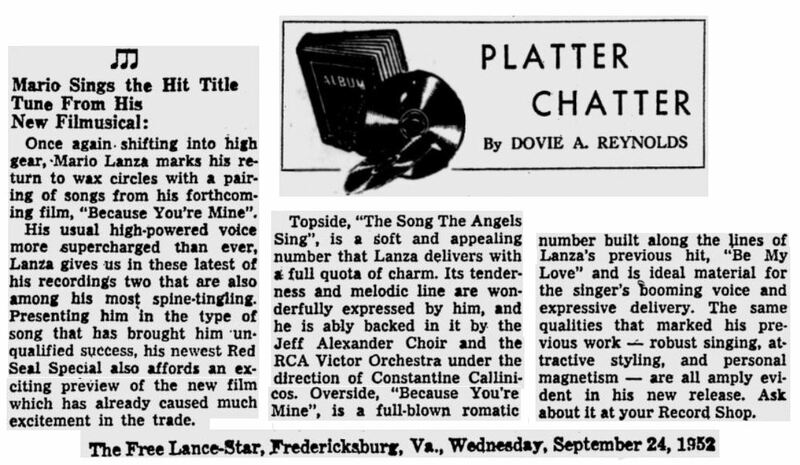 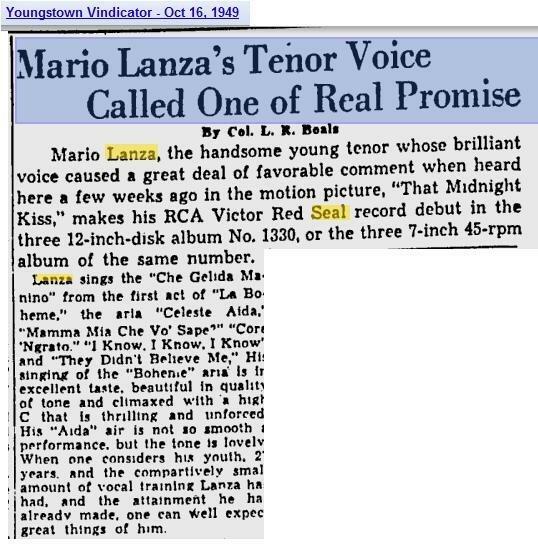 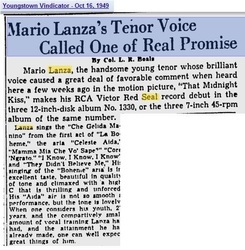 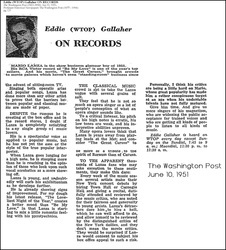 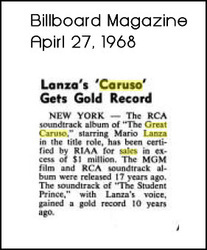 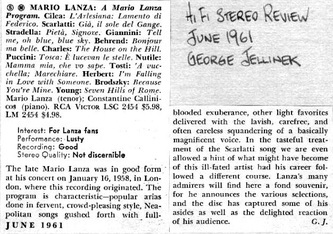 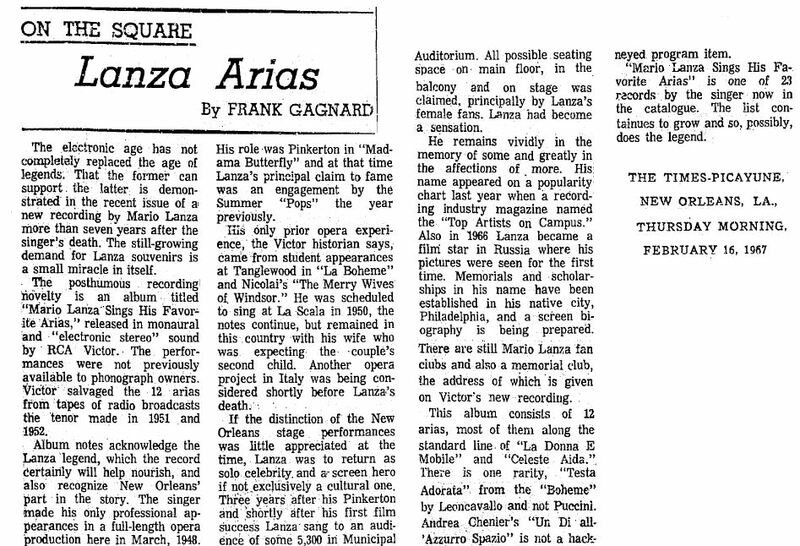 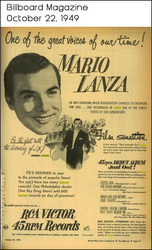 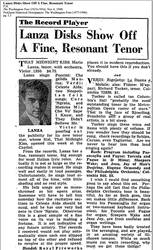 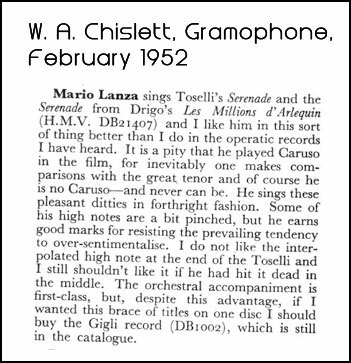 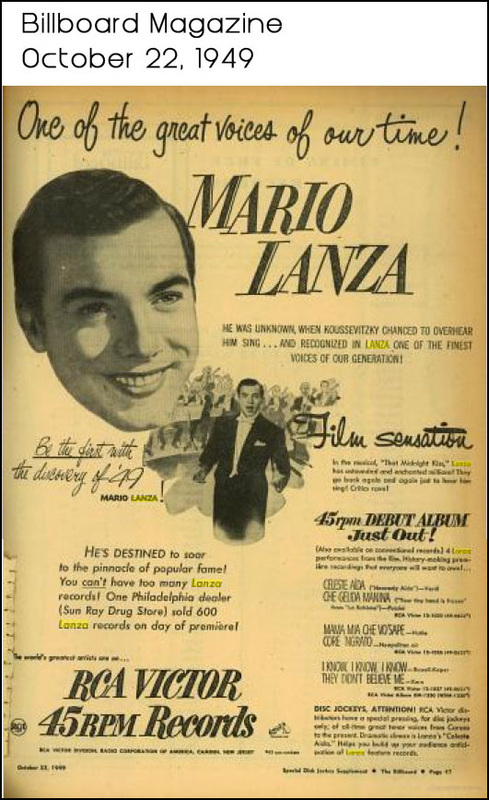 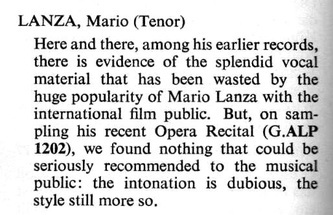 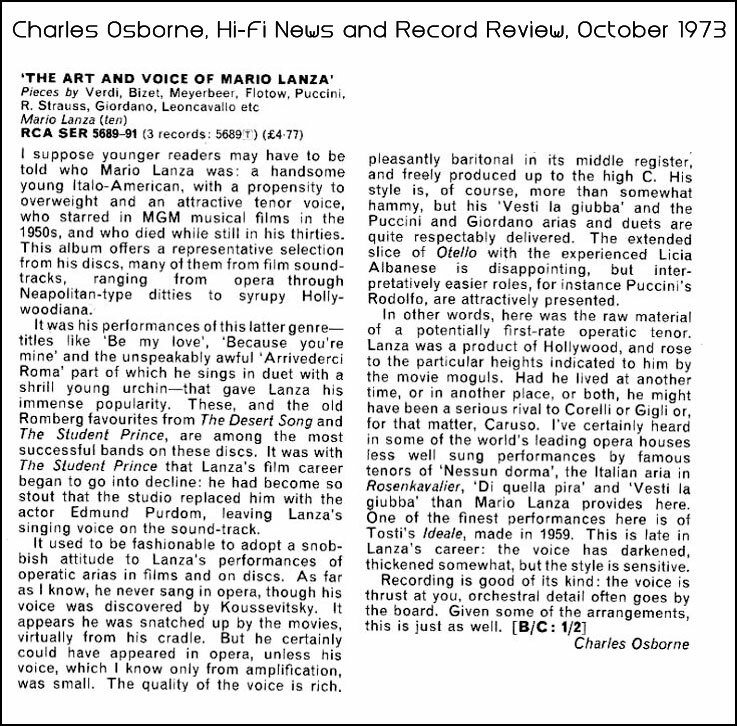 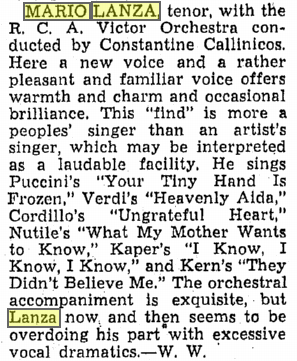 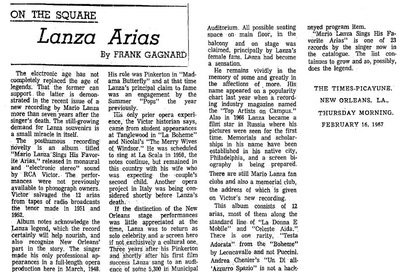 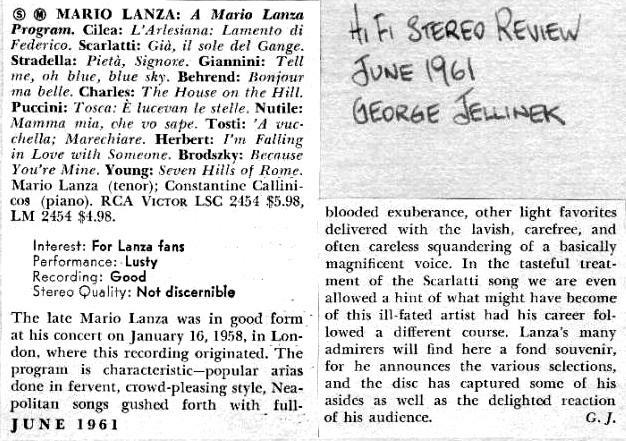 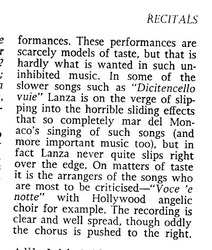 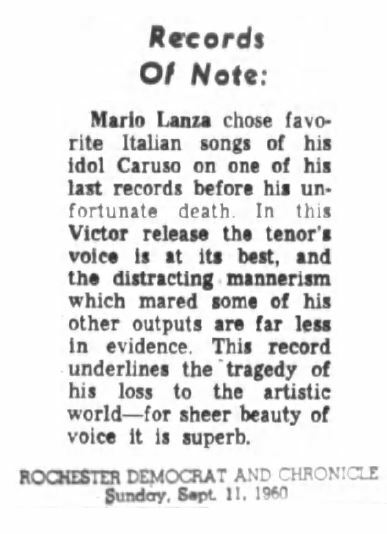 While such reviews reveal more about Mr. King and his ilk than they do about Mario Lanza, they also underscore the extent to which critical opinion of the tenor has improved since the 1950s.